Hitachi chose this year's CEATEC in Japan to unveil a new innovation that could well change the camcorder market. The company showcased a prototype camcorder that is able to stream high-definition video to a TV unit wirelessly and in real-time. 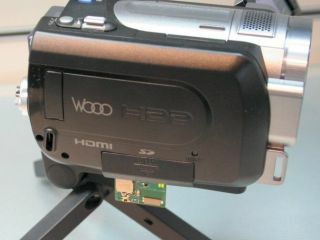 The way it works is by equipping a camcorder with a SDIO standard IEEE802.11g module, which does away with unwieldy wires. Although the technology is quite rudimentary at the moment – you just have to look at the picture to see this – it does bring about some interesting 'what-ifs' for the camcorder market. The ability to stream footage via a DLNA server straight to a monitor could do away with the need for tethering devices in the future, freeing filmmakers up to do more interesting shots. And anybody that has visited a film or television set knows that that is an enticing prospect.